On the back (or wrong side) of the light background squares, draw a diagonal line from one corner to the opposite corner. Place one background square on top (right sides together) of a medium 4 7/8” square. 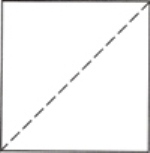 These are your four corner squares. Use the same method with the background fabric and the dark fabric, to make four squares. 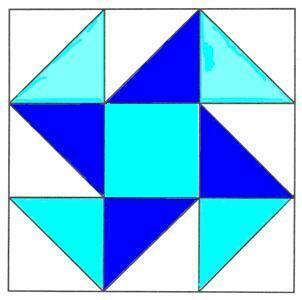 Arrange the squres as shown in the diagram at the top of this page, placing the 4 ½” square in the center of your block. Sew the three squares in the top row together and press the seams toward the outside. Sew the second row, pressing the seams toward the center. Sew the third row, pressing the seams toward the outside again. When you sew the top row to the middle row, make sure seams meet, butting up against each other to form a flat joint. Repeat when adding the third row.